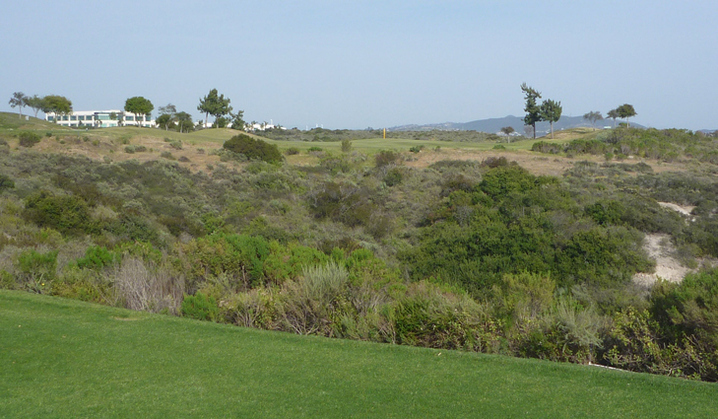 The Crossings at Carlsbad Hole 1: The first hole is downhill and relatively long with trouble in the form of hazard left and right, so the player should be good and warmed up to start the round. The approach is then downhill to a large green that is pretty wide-open and receptive to most shot shapes. The Crossings at Carlsbad Hole 5: Long, but downhill after the tee shot and usually down wind, this par five can be reached in two. The drive looks scarier than it is as the canyon is not in play for most drives. The ideal tee shot will stay just left of the aiming pole and catch the major downslope. From the fairway, the player must just avoid some bunkers left and right to a flat, but large green. The Crossings at Carlsbad Hole 6: The toughest hole on the front nine is distinguished by hazard running all the way down the right on the tee shot. However, the approach to the green is best attacked from the right side of the fairway. The green is uphill, tiered and extremely well protected by a massive bunker. Ocean views are afforded from the tee box as well, which is a nice bonus. The Crossings at Carlsbad Hole 7: This par five has OB running all the way down the left side for the first two shots, but the signature hole is created around the green complex that is separated by a lake, complete with waterfall to the right. The golfer must find the correct quadrant of the green to avoid a crazy tier in the middle. The Crossings at Carlsbad Hole 8: This is a short, uphill par four that requires a layup for anybody who cannot hit a 300 yard bomb at least on the fly (99% of all golfers). The approach should be a short iron over the ravine to a rather large green that is more wide than deep. 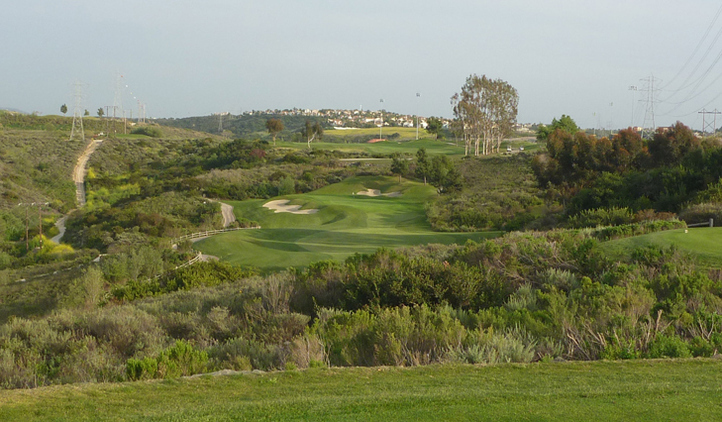 The Crossings at Carlsbad Hole 10: This short par four is classic risk versus reward. From the elevated tee, driving the green is an option when downwind, but the hole is tight and anything not finding fairway or limited rough will earn a penalty stroke. Also, the massive bunker left of the green will not make up and down easy. The Crossings at Carlsbad Hole 11: Yet another downhill par four, this one plays way shorter than the yardage. The player needs accuracy from the tee and the fairway fees all shots to the right, so anything that starts too far right will likely find the hazard. The green is angled and can feature awkward lies and difficult chips for anything that misses to the right. Some long, undulating putts can also be encountered, so distance control is key. The Crossings at Carlsbad Hole 12: This is a solid straight par four with hazard down the right and hillside left. The green complex may be the best on the course with a very deep swale to the front left and mounding right. The green itself doesn't have a tier, but has a high center, and if the golfer has to putt over that, the downhill side of it is treacherous. The most interesting thing about this hole, however, is the drive to it. My understanding is the coastal commission of Carlsbad wouldn't allow the building of another hole going in the opposite direction. So, after the 11th green, the player drives behind the 12th green and all the way down the hole on a protected cart path, just to get to the tee box. It's the only hole I know you drive in reverse before playing. The Crossings at Carlsbad Hole 13: Short and straight, this pretty par four doesn't require length, but two accurate shots should be played to negotiate the bunkers and hazards that await on either side of the fairway and green complex. The putting surface is tricky to read as well. The Crossings at Carlsbad Hole 15: The ideal drive on this par five is over the corner, which means it it blind. With driver, too far right will find the bunker or the hazard and too far left will be OB. The other option is to lay up and then play the second shot short of the canyon that crosses the fairway about 100 yards from the green. The putting surface is elevate and wide so hitting it with a long iron is tough to do. The Crossings at Carlsbad Hole 16: This par five has a challenging drive from the elevated tee, but a good one can set up a great birdie opportunity. The green is elevated and behind a large central bunker in front. The Crossings at Carlsbad Hole 17: The par threes at Crossings at Carlsbad are not particularly memorable, but the last one of the day is clearly the best of the bunch with great views of Carlsbad and the Pacific Ocean, but also with obvious penalty stroke trouble to the right and a difficult to putt green. 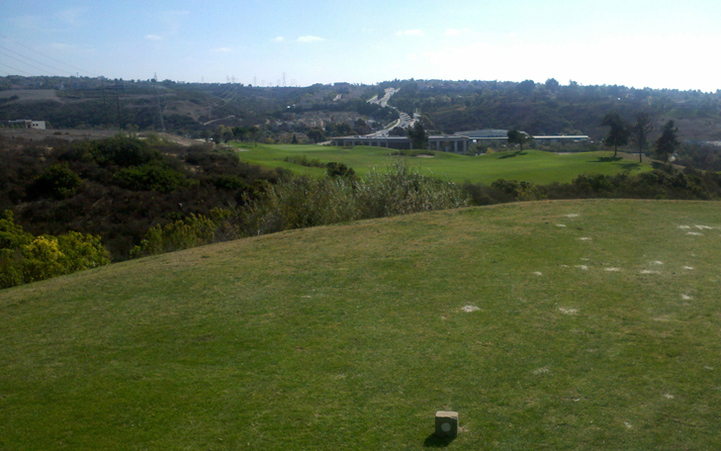 The Crossings at Carlsbad Hole 18: There is OB left and canyon right on this drive and the fairway pinches in for driver. The approach is a tough one to an angled green where short-right is dead and long-left will leave a pretty tricky, downhill chip to an undulating green. The views from the last fairway are a good way to end the day.